Mountain Home Inspections, LLC, is a full-service home inspection company serving Buncombe and surrounding counties in Western North Carolina. We are family owned and operated, have an exceptional work ethic and uncompromising standards. We strive to combine the highest technical skills with superior customer service to help you make informed decisions when buying or selling your home. At Mountain Home Inspections, LLC, our mission is to assist home buyers, sellers and investors by providing an objective inspection of the home’s systems. Our company is dedicated to providing you with the most detailed and accurate information you need to make an informed decision. Our inspector is formally trained by the American Home Inspectors Training Institute (AHIT), is licensed by the North Carolina Home Inspectors Licensure Board (NCHILB), and is a certified member of the International Association of Certified Home Inspectors (InterNACHI). Guided by the principles of these organizations, our inspections are performed according to the highest Standards of Practice and strict Code of Ethics, protecting the consumer from conflicts of interest and ensuring an independent evaluation of the property. After a thorough analysis of the subject property, we provide a comprehensive, computer-generated report highlighting the critical areas most important to you as the real estate buyer, seller or investor. 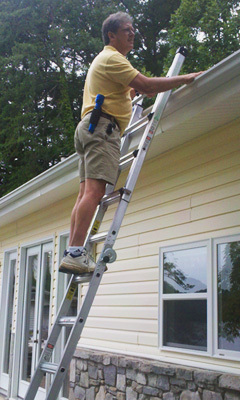 Mountain Home Inspections, LLC is fully licensed and insured, as required by NC law.